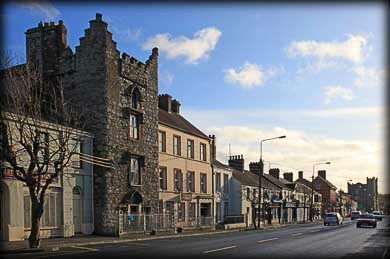 The smaller of two "castles" in the centre of the market town of Ardee, Hatch’s Castle is a fine example of a late 14th Century urban fortified house that was once found in many towns throughout Ireland. Clearly identified by its unusual rounded corners, it's four storeys are constructed of hammer-dressed masonry in irregular courses that is obscured in places with patches of plasterwork, and is crowned with a wall-walk and battlements. The southeast corner has a projecting turret which houses a spiral stairway to roof level. 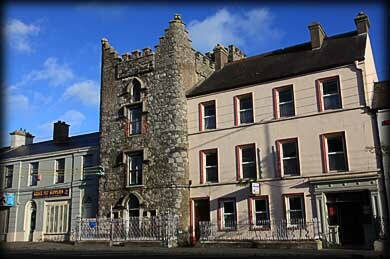 Given to the Hatch family by Oliver Cromwell, it is still in use as a private family home and is the older of the two castles on Ardee's main street. It was modernized in the 19th century with large windows placed in the east and west faces. All floors, fireplaces, the roof and crenellations are modern. An original chimney projects from the north side above the adjacent house. Locally it was believed that the castle was connected to St Mary's Abbey by an underground passage. Luck was with us as we passed through Ardee, we were able to get a clear shot of the building, usually there are cars parked in front of the tower house. 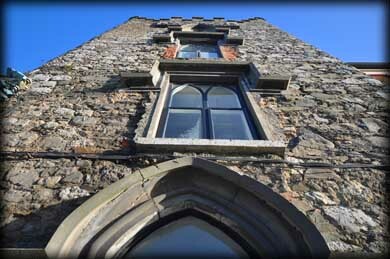 Situated: As you enter Ardee from the south Hatch's Castle is located on the eastern side of the main street about 150 metres north of Ardee Castle. Discovery Map 36: N 9609 9070 Last visit Dec 2011.